The characters in this book are so vivid and real, they take up residence in my heart. I became especially attached to Andras Levi, the book’s main character. The love the characters have for each other is deeply touching; I was particularly moved by the relationship between Andras Levi and his older brother, Tibor. Orringer’s writing is exquisite and vivid. The first part of the book is set in Paris, where Andras moves to from Hungary in order to attend architectural school. I love “moving” to Paris with him, as he finds his place in a new city and tackles learning a new language. The Italian student in me can relate to his challenges in trying to gain command of the language. I value the historical perspective of World War II from the Hungarian-Jewish point of view. Despite the amount of WWII books I have read, I was unfamiliar with the details of this particular struggle. My heart aches. I first read this book January of 2013. As soon as I finished, I wanted to read it again immediately. Having just completed The Invisible Bridge for a second time, I enjoyed it even more. It is an intense read, particularly the final 150 pages. I highly recommend this literary treasure. The Invisible Bridge received a number of accolades, including a New York Times Notable Book, and Best Book of the Year from The Christian Science Monitor, The Boston Globe, The Washington Post and Entertainment Weekly. Orringer is also the author of the award-winning short-story collection, How to Breathe Underwater. Please feel free to share thoughts on this book or another one of your favorites in the comments section below. Happy reading! 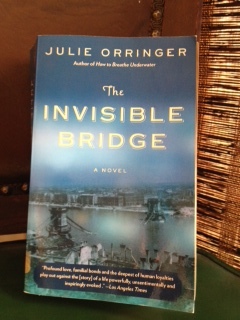 Tags: booklove, Books, Julie Orringer, The Invisible Bridge, World War II books. Bookmark the permalink.